You can keep the fun of this past Sunday's SpikesFest going with the SpikesFest Flex Book Special! Every Spikes Flex Book order placed until the end of business on Friday, March 8 means you get a BONUS voucher - 13 undated vouchers for the price of 10! 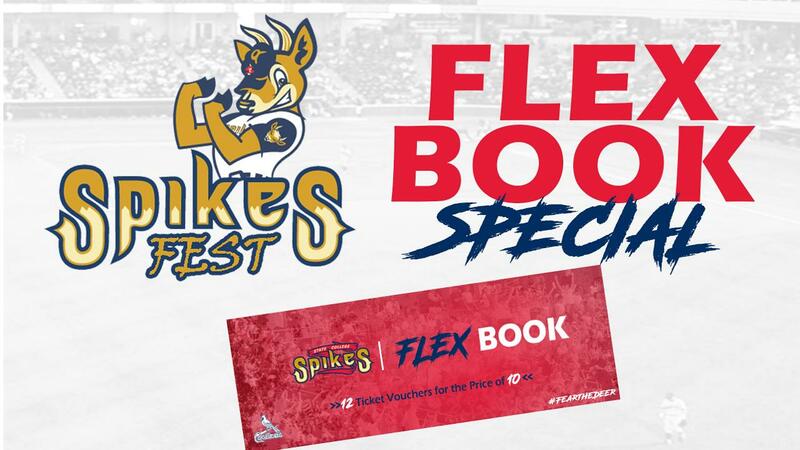 If your schedule is flexible, the Spikes Flex Book is for you! Get more info on Flex Books and purchase now! Each book contains 12 undated vouchers for the price of 10! Vouchers can be redeemed for tickets to any 2019 State College Spikes regular season home game, based on availability. See the 2019 schedule here. Purchase a Flex Book from now through the end of business Friday, March 8 and get a BONUS 13th voucher! Affordable and makes a great gift, especially to bring your special someone to a ballgame! Offers great flexibility! Use all of your vouchers at one game or come to 13 different games - it's up to you! Vouchers can be redeemed in person at the Medlar Field at Lubrano Park Ticket Office in advance or on the day of the game. Each flex book also includes one (1) coupon for either ten (10) free ball launch balls or five (5) free "Closest to the Pin" golf balls to be used after any 2019 Spikes home game.